Balin and Dwalin, sons of Fundin are probably two of the most easily identifiable members in the Company of Dwarves led by Thorin Oakenshield. In the movie The Hobbit: An Unexpected Journey they are the first two dwarves that show up at Bilbo’s door, and manufacturer The Bridge Direct wisely decided to offer them together in a 2-pack, although I am pretty sure that each would have sold well individually. 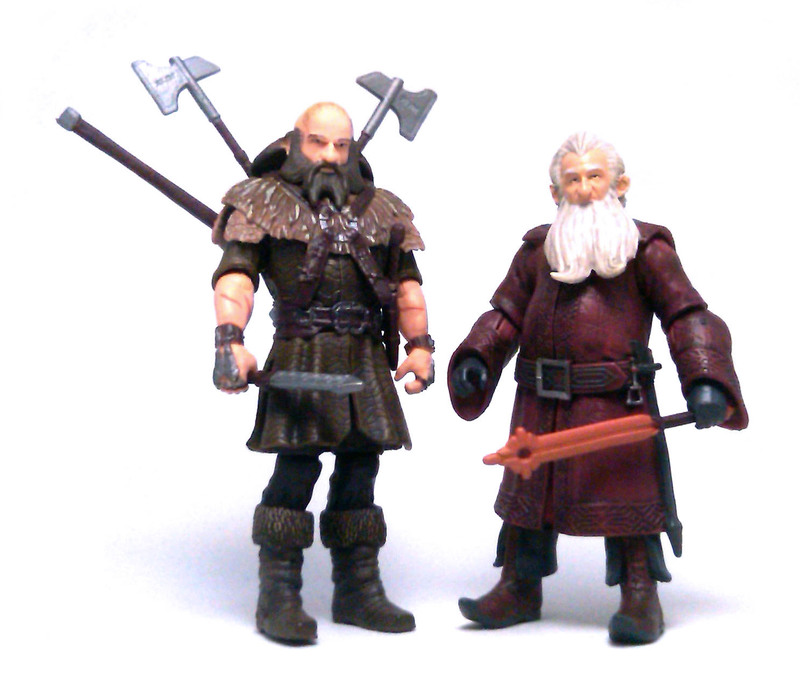 Their appearance is strikingly different, with Balin being a shorter, fairly respectable-looking dwarf while Dwalin is quite obviously a very fearsome warrior. Both figures display intricate geometric patterns sculpted onto their tunics, and the likeness to actors Kevin Stott (Balin) and Graham McTavish (Dwalin) is actually quite remarkable, even under all the dwarven make-up. 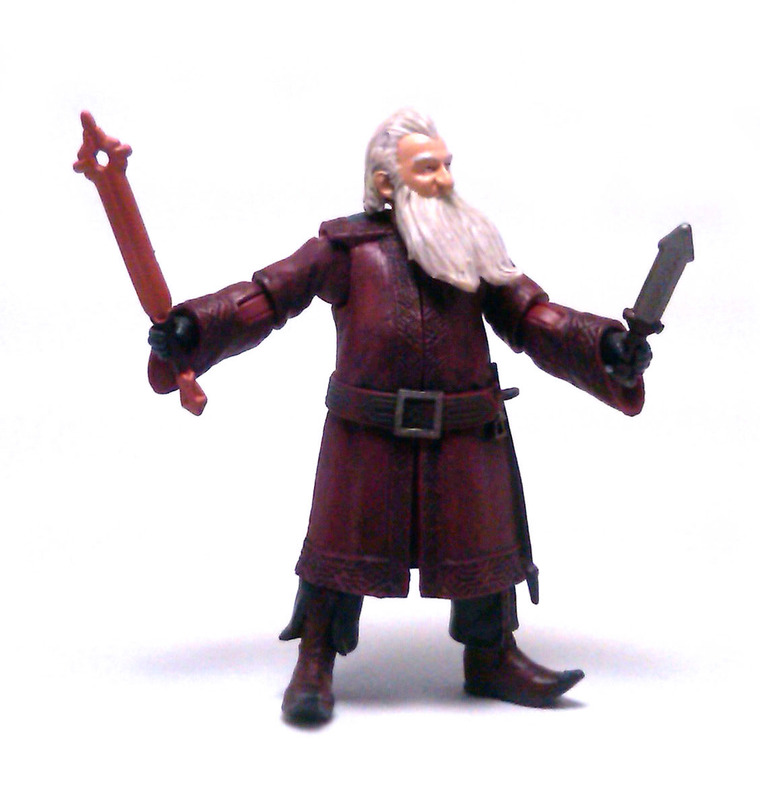 Balin wears a stylish, dark red tunic with a broad belt, dark gray gloves and upward pointed boots. The overall impression is that of a wealthy dwarf clad in expensive clothing, a look further enhanced by a fairly well groomed beard. 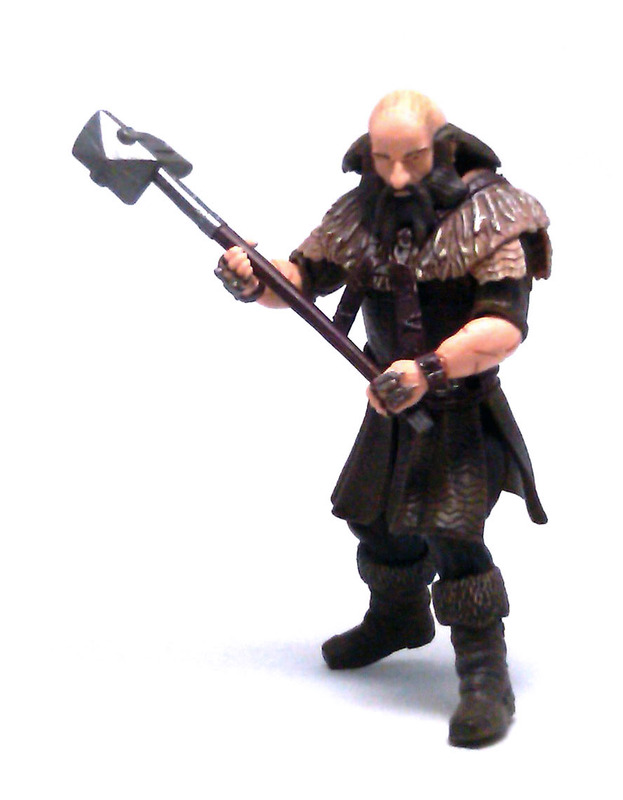 Dwalin, on the other hand, looks more like a brawler that is no stranger to an outdoors lifestyle. He wears a short tunic, a pair of heavy boots, a fur collar with some leather straps to carry his gear on and iron knuckle guards. To round up his appearance, he also has a large tattoo on top of his head and numerous scars on his head and forearms. Given the difference in their character designs, not all of the joints work the same on both figures. 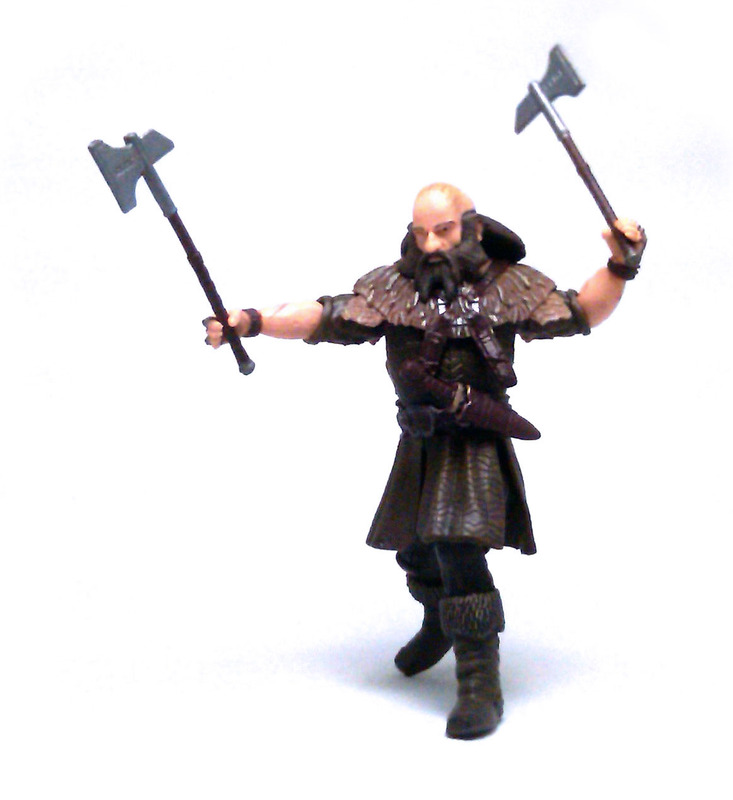 On Dwalin, the fur collar limits the range of motion at the neck and shoulders, although the short tunic design allows for a better range from the hip joints. 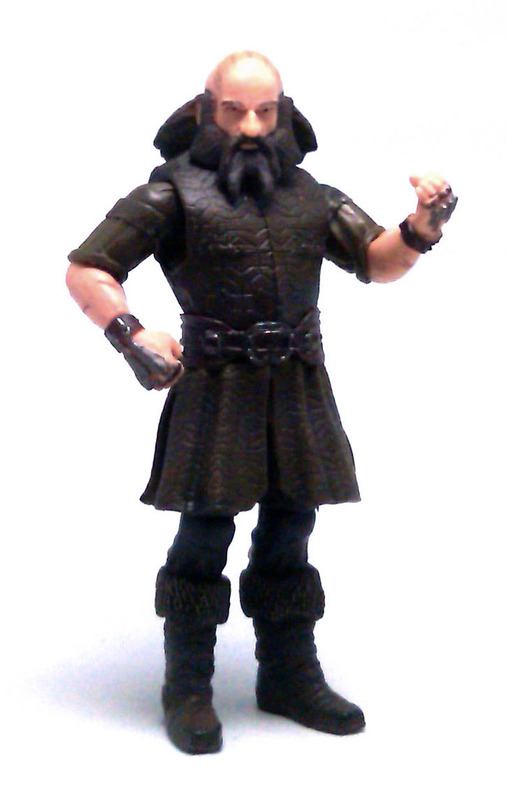 Balin, on the other hand, has superb upper torso and arm articulation, but the longer tunic hinders greatly the leg joints, allowing only for the knees to bend a little and to rotate sideways. The paint application on both dwarves is consistently good. 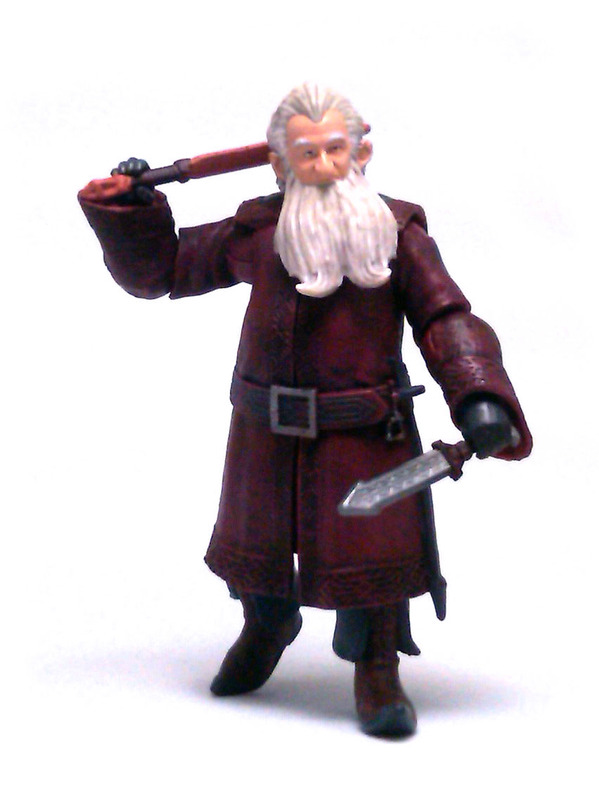 Balin has a very dark shading wash applied over his long tunic, with dark grey accents matching the color at belt, boots and gloves. 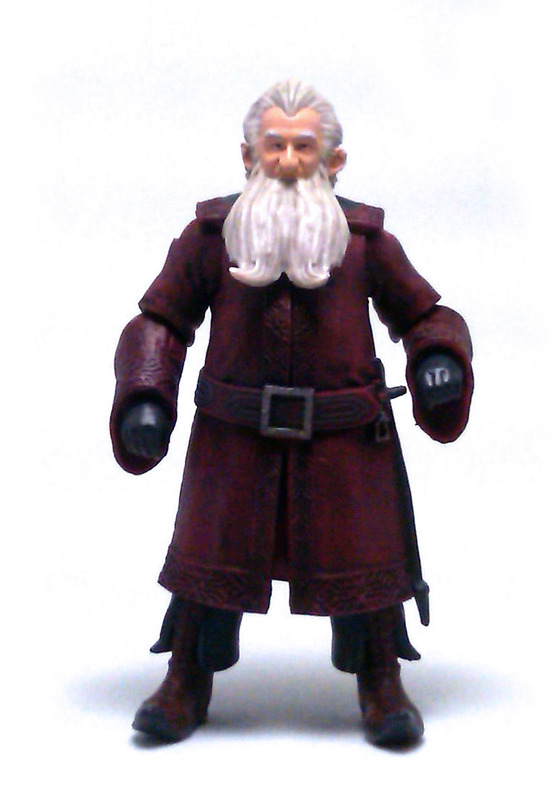 Balin also has a lighter shading wash applied over his beard and neatly painted eyes and eyebrows. Dwalin has an earthen color palette consisting in browns and tans. The tunic also received a shading wash to bring out the textures, and the furry bits received some highlights as well. Also, there are steel colored accents painted to portray buckles and clasp on his leather gear, as well as the spiky bits on his knuckle dusters. 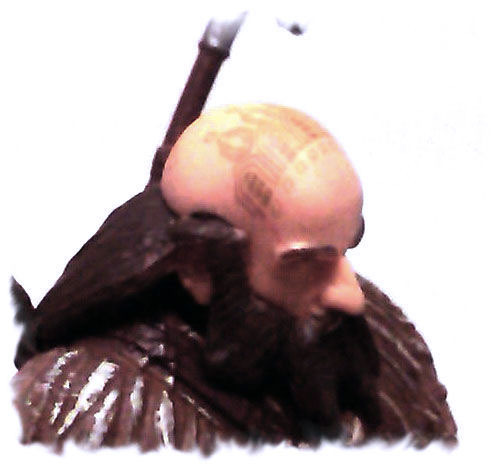 Dwalin’s tattoos are very well applied and look very realistic and complex, although they kind of look like dot-printed on his head. Between the two dwarves, this set contains a rather sizable armory consisting on a large war hammer, a couple battle axes, a short sword, a dagger with a separate scabbard and an oddly shaped blade that belongs specifically to Balin. 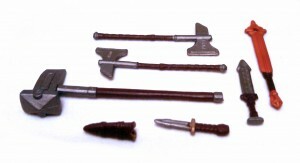 Dwalin can carry the rest of the weapons on himself and still hold Balin’s weapon, further illustrating that he is the tank in Thorin’s group. The overall feel I get from this set is that these are very nice and very detailed collectible action figures. The limited articulation does hurt their playability a little, sure, but it is really no worse than the myriad senator–type figures I’ve been getting over the years from the Star Wars lines. And besides that, there is no way they could achieve this level of detail using soft goods instead of plastic.